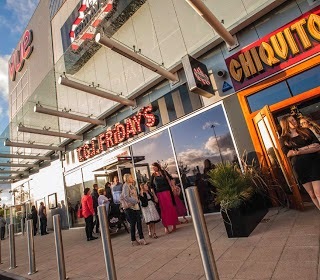 A while back, Rick & I reviewed Chiquitos at Glasgow Fort and we had a fantastic dinner washed down with a delightful cocktail before heading to the cinema. Very civilised and we thoroughly enjoyed the experience. I was invited back to dine at the restaurant, this time with the kids to see what the experience was like as a family. Of all the chain restaurants, Chiquitos to me is more for the 'grown-ups' - not a balloon in sight! Anyway, we took along my friend Lauren (Living in a Boxx) with us as I wasn't sure I'd manage to deal with my two cheeky rascals at the same time and I'm very glad Lauren was there to assist! As with our previous experience, the food was really good. The kids wolfed their chicken nuggets and chips. I had two starters instead of a main - pulled pork tacos and Mexican fritatta - both of which were beautiful; and Lauren really enjoyed her steak wrap. There was so much choice on the menu that we really did struggle to make our minds up! My son then had churros for dessert whilst I demolished his kids ice cream. Lauren had a chocolate brownie that looked divine. The food was really good quality, the portion sizes were good and in my opinion it was great value for money. The four of us ate two courses plus drinks for £50*. What was disappointing was that there wasn't really any Mexican food on the kids menu. My two really enjoy a mild chilli with rice and wraps but this wasn't an option. It was chicken nuggets, sausages and mash and pizza that were available. The kids activity packs that we were given were also aimed at slightly older children and they could have benefited from a simple colouring in sheet rather than the complicated game. The kids were given tall glasses for their juice, but were unable to get to the straw because the tumblers were so high. This then proved stressful for me as I had to keep a watchful eye the whole time in case they toppled over. Similarly the ice cream was served in a tall sundae glass which the littlest struggled to reach... she ended up kneeling on the seat for most of the meal. Smaller glasses and a lower dish for the kids desserts would have been better in my opinion; just a few little things that would have made my experience a bit more enjoyable. I'm not sure I'd go back to Chiquitos with the kids at the ages they are just now, but I'll certainly go back on my own with friends or with the kids once they're older. We did a bit of vlogging whilst we were there and you can see some footage of our food and our chat in the clip below!! * I received a £20 voucher in exchange for an honest review. As always opinions are my own. Thanks again for inviting me, next time no kids and cocktails rather than ice cream!